Two-year-olds by the inform sire Kodiac were in demand at today’s Goffs UK Breeze Up Sale as the stallion produced the top two lots of the day. In total six horses sold for over £100,000 with the top price of £170,000 achieved twice in today’s sale with Tally Ho Stud’s colt out of Good Clodora (Lot 55) selling to Blandford Bloodstock and Bansha House Stables’ colt out of Esuvia (Lot 45) selling to Peter Swann’s Cool Silk Partnership and Stroud Coleman Bloodstock. American based stallions also proved popular with Lynn Lodge Stud’s Mizzen Mast colt (Lot 139) selling to Hillen & Ryan Bloodstock for £155,000 while Fairgreen Stables’ Sidney's Candy colt (Lot 137) was knocked down to the bid of David O'Meara for £150,000. Mocklershill also provided one of the highlights with their Showcasing colt (Lot 53) who was purchased by Alex Elliott and George Scott for £140,000. “Today has been a day of highs and lows. 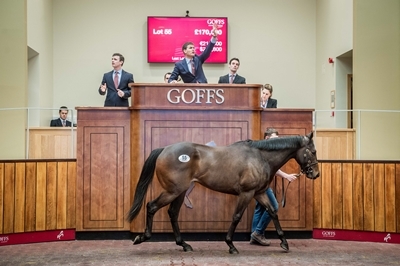 The highs have been some excellent results for a number of two-year-olds headed by a number of six figure lots topped by a brace of Kodiac colts at £170,000. However it would be churlish of us not to recognise that trade has been mixed in parts and really quite challenging in the lower echelons of this specialist market which has been quite graphically reflected in the sale statistics. “Of course the Doncaster Breeze-Up has been a trailblazer for many years and our successes have forced others to play catch up but it will be important that we review the sale in the context of the complete market in a month or so, taking into account the feedback from every quarter as there are always things we can do better. What we are sure of is that today’s sale will generate another huge number of winners at a high level, so repaying the faith of those who bought into the concept.